Home » Life » Quino-what? Let’s lighten up a little today. Deep concerns over recent current events have me feeling heavy and weighed down. Perhaps today would be appropriate for a lighter topic. 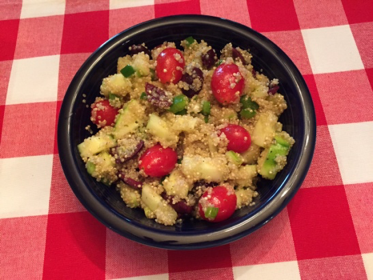 Actually, it’s a lot lighter – a summer recipe with quinoa. Have you tried it? Quinoa has become one of my favorite foods. I stumbled on this salad recipe last year and it is one of my favorites, especially on a hot summer day. Quinoa, pronounced “keen-wah” is a grain that is becoming increasingly popular. Even the Pope will receive a quinoa communion wafer during his visit to Bolivia this week! The National Restaurant Association has named quinoa as a hot trend in side dishes among chefs. Quinoa is gluten free, full of fiber, rich in iron and vitamin B, and has a nutty flavor. The Whole Grains Council states, “It’s not surprising that quinoa supports good health, as it’s one of the only plant foods that’s a complete protein, offering all the essential amino acids in a healthy balance.” Referred to as the “mother grain” and as a “super food” quinoa is available in white, red and black. Quinoa flakes and flour are available, usually at health food stores. Toss everything together and add Lemon Oregano Dressing. This dish is fresh, healthy and filling. The combinations are endless. Give it a try!